SUPREME principally comprises of an investment holding company with four (4) subsidiaries. Our subsidiaries are principally involved in the distribution and warehousing of Frozen Meat, Chilled Food, Dairy Products and Dry F&B Products. SUPREME is principally an investment holding company with the following four (4) fully owned subsidiaries. SCS is involved in the distribution of Frozen Food (Beef, Lamb and Mutton, Poultry and Seafood) and Dairy Products. SCS products are distributed throughout Sarawak and are catered to Wholesalers, Retailers, and Food Service providers. SFS is involved in the distribution of Dairy Products, Dry F&B Products, Frozen Food and Chilled Food such as Cheese, Butter, Milk, Milk Powder, Margarine and Juices from local and imported brands. SFS products are distributed throughout Sarawak, Sabah and Brunei and are catered to Wholesalers, Retailers and Food Service providers. BFL is principally involved in the distribution of Frozen Meat (Beef, Lamb and Mutton, Poultry and Seafood) as well as Dry F&B, Chilled Food and Dairy Products. Its products are distributed to Miri and Brunei, with its operations based in Miri. 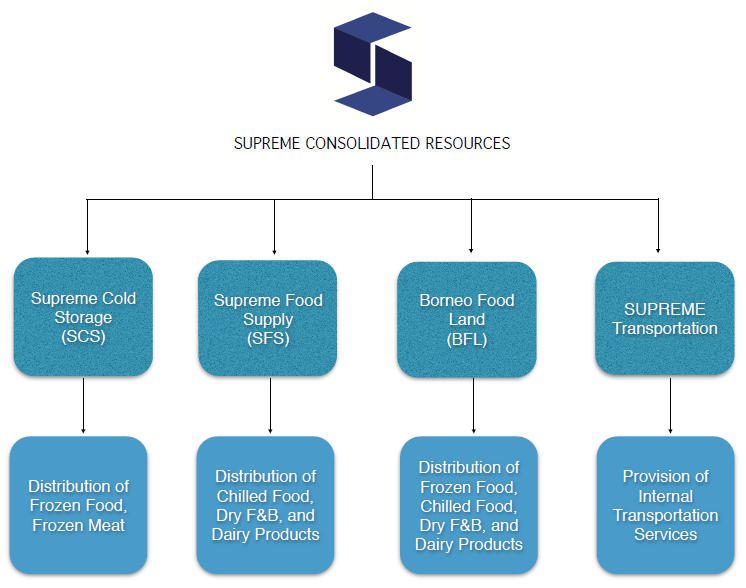 Supreme Transportation Sdn Bhd is principally involved in the internal provision of logistics and transportation services to as far as Saratok.